Rhizoma Pinelliae is produced in most parts of China. The tuber, which is collected in summer and autumn, is cleaned, dried in sunlight, and sliced. It is used unprocessed, or it can be processed with ginger and alum to form Fa Ban Xia. Properties & Taste: Pungent, warm and toxic. 1. Phlegm-damp cough due to deficient spleen manifested as cough with profuse, dilute and white sputum. Pinellia tuber (Banxia) is used with Tangerine peel (Chenpi) and Poria (Fuling) in the formula Erchen Tang. 2. Nausea and vomiting due to rebellious stomach qi: a) stomach cold typePinellia tuber (Banxia) is used with Fresh ginger (Shengjiang) in the formula Xiao Banxia Tang; b) stomach heat typePinellia tuber (Banxia) is used with Bamboo shavings (Zhuru) and Loquat leaf (Pipaye); c) pregnancy typePinellia tuber (Banxia) is used with Perilla stem (Sugeng) and Amomum fruit (Sharen); d) stomach weakness typePinellia tuber (Banxia) is used with Ginseng (Renshen) and Jujube (Dazao). 3. Globus hystericus due to qi stagnation and accumulation of phlegm-damp manifested as a feeling of having a foreign body in the throat, fullness and distension in the chest and epigastric region and nausea. Pinellia tuber (Banxia) is used with Magnolia bark (Houpo), Perilla leaf (Zisuye) and Poria (Fuling) in the formula Banxia Houpo Tang. 4. Goiter, scrofula and subcutaneous nodule. 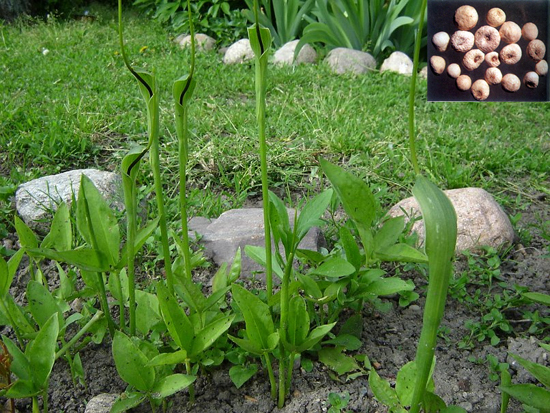 Pinellia tuber (Banxia) is used with Laminaria (Kunbu), Seaweed (Haizao) and Tendrilled fritillary bulb (Chuanbeimu). Dosage: 5-10 g, decocted in water for an oral dose. Appropriate amount for external use. Cautions & Contraindications: This herb is contraindicated in cases with dry cough due to deficient yin, or cough due to phlegm-heat. Also, it cannot be used together with the herb Sichuan aconite root (Wutou).